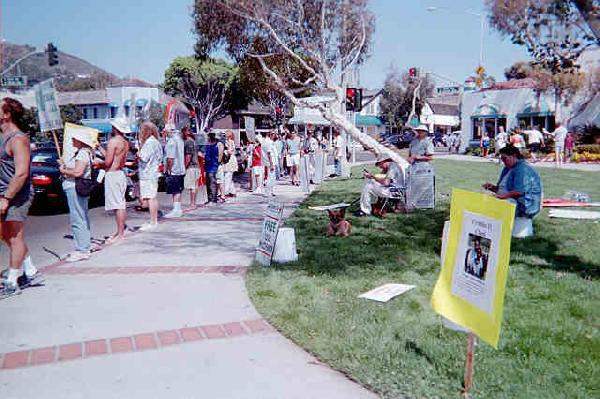 About 50 people from the November Coalition gathered in Laguna Beach in August to protest against the War on Drugs. Many had family and friends in prison for the crime of being addicted or the crime of trying to stay alive by using doctor-recommended cannabis. While the rest of the world decriminalizes or legalizes marijuana, and softens their stance on persecution of other drug crimes, the United States attacks and murders sick and dying people who use doctor-recommended medicinal cannabis to try to stay alive. While the rest of the world treats addiction as the health problem it is, and offers people treatment, the United States imprisons those who are addicted, poor, and people of color, and forces them into a slavery worse than indentured servitude. Marlene Rasnick, the DEA may have murdered you, but your life is now an inspiration for the rest of us to fight against this unjust government-sanctioned murder of innocent people! The sign hanging on the empty Los Angeles Cannabis Resource Center changed at the end of the Nov. 6 candlelight vigil from "DEAth" to "LIVES." President Scott Imler spoke at Monday's West Hollywood City Council meeting about how the center, though no longer operating, lives on as an idea. Imler also announced the death of Marlene Rasnick, an ovarian cancer patient and activist for medical marijuana. "She was a model of courage and determination to beat the odds," Imler said. There will be a memorial for Rasnick on Sunday at 2 p.m. at the Crescent Heights United Methodist Church, 1296 N. Fairfax Ave., to "honor the brave woman for her efforts and her life." The council adjourned Monday's meeting in Rasnick's memory.